Walk-In's provide a safe and independent bathing experience in a cost effective solution. Using the latest in tub crafting techniques and industrial grade materials Walk-In Tubs offer an impressive line to meet your specific needs. With ADA compliant designs and features, Walk-In Tubs offer the satisfaction and peace of mind needed to truly enjoy a luxurious soak. The Ivory 6 ft. Acrylic Centre Drain Oval Freestanding Bathtub in White can be interpreted as both classic and contemporary. Bathers will find additional support on each side of this double slipper tub, as the height rises on each end for deep soaking comfort. Aesthetically appealing and physically soothing, it creates an elegant, functional centrepiece for your bathroom. The high-gloss white acrylic bathtub is equipped with integrated overflow and pop-up drain outlets in chrome, ready for a complementary wall- or floor-mounted faucet (sold separately). Jasper bathtub collection features a series of corner oval-opening bathtubs, easily fitting two adults. 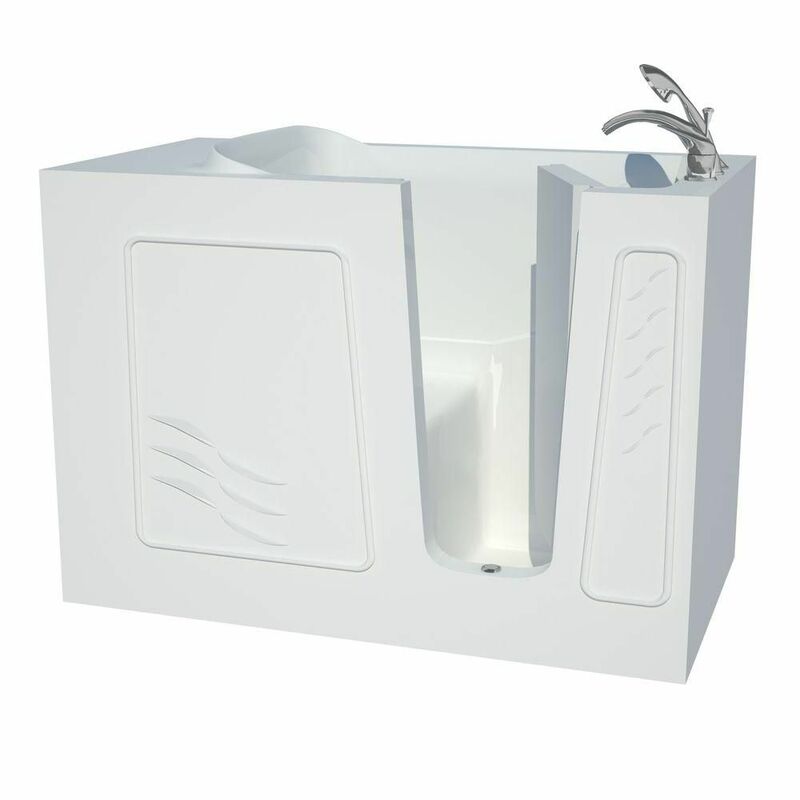 Molded-in seat is strategically placed across the tub filler to ensure luxury and comfort. 4.5 ft. Right Drain Walk-In Bathtub in White Walk-In's provide a safe and independent bathing experience in a cost effective solution. Using the latest in tub crafting techniques and industrial grade materials Walk-In Tubs offer an impressive line to meet your specific needs. With ADA compliant designs and features, Walk-In Tubs offer the satisfaction and peace of mind needed to truly enjoy a luxurious soak. 4.5 ft. Right Drain Walk-In Bathtub in White is rated 5.0 out of 5 by 1.